I realised a little while ago that my blog turned 1 at the start of October. I think a belated giveaway to celebrate is in order. 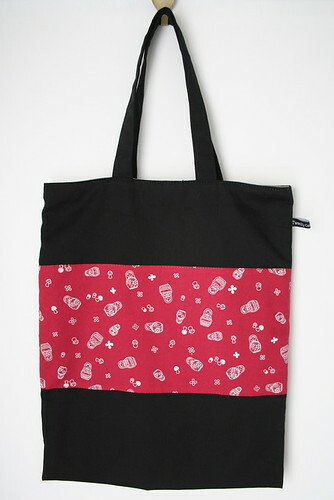 This tote is made from black cotton drill and red Matroyska print Japanese craft cotton and is lined with a soft grey cotton poplin. It measures approx 16" by 13" and the handles are 18" long. I really like this size of bag for shopping, library books or just carting around your essentials. To win it, leave a comment on this post by Friday 14th November. I'm taking a bit of a blog break this week to go to Melbourne for my brother-in-law's wedding. I'll be back on board next week to announce the winner of the tote bag. Edited to add: I sent out the group details for the ornament swap on Sunday night around 8.15pm. 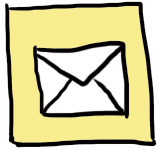 If you have signed up and not yet received an email from me, please check your spam folder as I have heard that my emails are getting filtered for some people. Has it really been a whole year? Oh my! It's been a year for us too- waiting for Michael to get a job, a year for me in my job. Enjoy your break! I'm a very recent subscriber to your blog, and am loving it! (And the large quantity of RED in your posts of late cannot help but make me happy!). Happy Anniversary, and enjoy Melbourne (how could you not!). Happy blogiversary. And enjoy Melbourne, I hope their weather is better than ours. A year of great reading! and hippier happier holiday in melby! Happy birthday to your blog! And thanks for going to all the effort of organising the craft swap, I'm excited about it, oh yes I am! Happy blogiversary. I hope the Christmas swap goes well. It's so nice to see some NZ only rather than US only swaps. Have a great time in Melbourne! And thanks for the ornament swap email - best get crackin! Happy Blogiversary and hope you have heaps of fun in Melbourne. Don't forget to go to all those crafty shops there!! Hope you have a great holiday and thanks again for organising the Xmas ornament swap. Right, now where are my needles and threads?? Happy blogiversary! Gorgeous bag too! Thanks for your e-mail for the Kiwi Christmas ornie swap - got started on some details last night - so excited! Happy blogging aniversary. It is totally addictive I find. Tell myself I have lots of other things I should be doing and have to read what everyone else has posted! Thank you for the group addresses for the swap. Will be getting started while away visiting in Blenheim. Be back later in the month. havent been reading your blog for long, but do like it! good on you for reaching a year! congrats on you post milestone! I've been lurking for a while now!